New Milford, Connecticut, where James Schriber has his shop, is in some ways a quintessential New England town. just now its long, central green is blanketed with snow and punctuated with Christmas trees. Handsome 19th-century clapboard houses and churches line the green, and the side streets are stocked with small, independent shops. You can almost hear the harness bells. A short sleigh-ride away, however, just across the frozen Housatonic River, lies Route 7 and a ten-mile stretch of the 20th century in all its McDonaldized magnificence. It turns out that New Milford balances its grace notes with grit and its gentleman farms with blue-collar housing. The mixture gives the town a distinctive tang. It’s not as quaint or as contented as some of the neighboring towns, but it’s a little more vibrant. 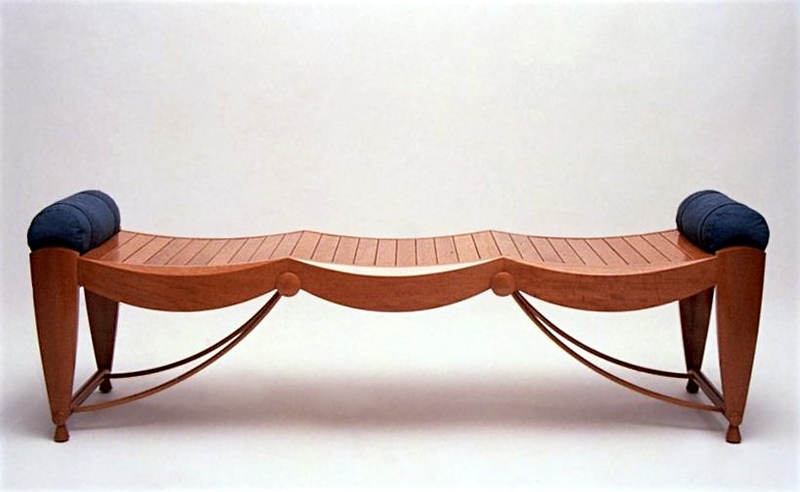 In his 25 years in New Milford, Schriber has built an outstanding career as a custom furnituremaker by striking a similar balance: one between the pursuit of beauty and the demands of necessity. 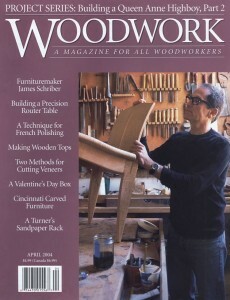 Even before he left Boston University’s Program in Artisanry (PIA) in the late 1970s, where he studied furnituremaking under Jere Osgood, Dan Jackson, and Alphonse Mattia, Schriber was planning a career that would embrace cabinetmaking and millwork as well as fine furniture. In his last year at PIA he set up a business with two friends, an architect and a builder, with the idea that the company would design and build houses and also design and provide all the millwork and built-ins for them. The company dissolved in the early 1980s, but Schriber’s two-sided output continued. A recent visit to his shop, where he works with two assistants, revealed several large commissions for built-in cabinets underway in addition to a run of side chairs. At first, the arrangement was largely a matter of survival. Schriber knew that it would be far harder to set up a wellequipped shop and make a good living if he worked exclusively on furniture. Schriber continues to find cabinet work more lucrative than furniture, but the benefits of the balance-he says he does about 50% furniture and 50% cabinet jobs-go far beyond the money. The two types of work express two facets of his personality: they allow him to stand with one foot on either side of the divide between the artist and the artisan. Which is where the cabinet work comes in. His cabinets (some designed by him, some by architects or designers) are made to a high standard, but they don’t begin to demand the same psychic power surge that designing furniture does. Schriber calls cabinet work a physical challenge rather than an intellectual one, and he still relishes the occasional installation, which he likens to a bracing hike in the hills. “To rent a truck and load it full and drive into New York at some ungodly hour, then carry the stuff down some stairs and up freight elevators and get it into the apartment and put it together—that’s a great challenge.” There’s a matter of identity, too. Although Schriber is deeply immersed in aesthetics, he doesn’t seem entirely comfortable calling himself an artist. “Sometimes,” he says, “I like just being a working guy, a tradesman.” Another part of his identity is linked to the success of his business, where he has employed between two and four craftsmen for more than twenty years. “I’m certainly no businessman, but I’m businesslike… I guess I like running a little business as much as being an artist.” Ever candid and introspective, Schriber wonders aloud whether his furniture might have been further developed by now if he had focused more narrowly on it. It seems unlikely. If I were asked to assemble the ideal person to make custom furniture, I don’t think I could improve on his blend of attributes—his skills as a business owner, a craftsman, an engineer and an artist. And his furniture speaks for itself. The hammer marks are not visible in the finished pieces. Schriber’s best furniture is remarkable for its elegant overall forms, for its superb detailing, and for being so completely thought-through, so thoroughly resolved. Schriber works comfortably within the framework of furniture history, drawing inspiration from sources as disparate as Ancient Egypt and mid-20th century France. All sorts of other man-made things also influence him, particularly architecture and automobiles. Familiar flavors from these places are often perceptible in his furniture, but the power of the work derives from the fresh and surprising way Schriber filters and recombines them. “I find myself designing things that are conventional, and yet not,” he says. In the case of his blanket chest, which he designed in the mid-1990s, he began by looking at examples of what for him are prototypical blanket chests—the sort of stout, dovetailed boxes made in the 17th century in the Connecticut River Valley. The quirk in the piece arose when he decided he wanted a shaped top and then, inspired by the doors of the Mercedes gull-wing sports car of the mid-1950s, he split the top and hinged it at the ends. 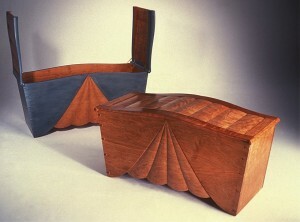 In a nod to the Connecticut chests, which were often carved, he cut an abstract design reminiscent of curtain folds into the solid wood sides. He used traditional dovetails at the corners of the chest but let the pins protrude in a manner that recalled the emphasized exposed joinery common in the 1970s. Conventional, and yet not. Schriber often employs a similarly loose and widely ranging associative approach to design. His three-seat bench, he says, relates to the scoop-seated chairs and stools found in King Tutankhamen’s tomb and to Greek klismos chairs, but they also contain a reverberation of his interest in Fiji Island headrests. Schriber’s bench design absorbs these influences and goes beyond them to create a piece with its own intriguing personality quite distinct from any of its antecedents. Schriber is also adept at a more narrowly interpretive design strategy. Over the years he has made a dozen or more pencil post beds that demonstrate a gift for twisting a traditional form. When he was first asked to make a pencil post, he says, “I started looking at old ones and immediately liked the form. So I didn’t want to go too far from it. I just wanted to distill it, figure out what it was at its most minimal, and then take it somewhere so it looked fresh.” Traditional pencil posts had sawn-out headboards, Schriber notes, “so the punctuation had to be right there.” His updated version of a sawn-out headboard brings a dash of Art Deco to the piece. Schriber typically works to a context. His designs respond to the intended function of a piece, to the tastes of the client, and to the feeling of the place where the piece will live. His ebony liquor cabinet is an illuminating example of a piece conceived in response to its context. Some customers of Schriber’s took a trip to Africa and returned with a collection of abstract stone sculptures. They asked him to make a liquor cabinet that would also display one of the sculptures. 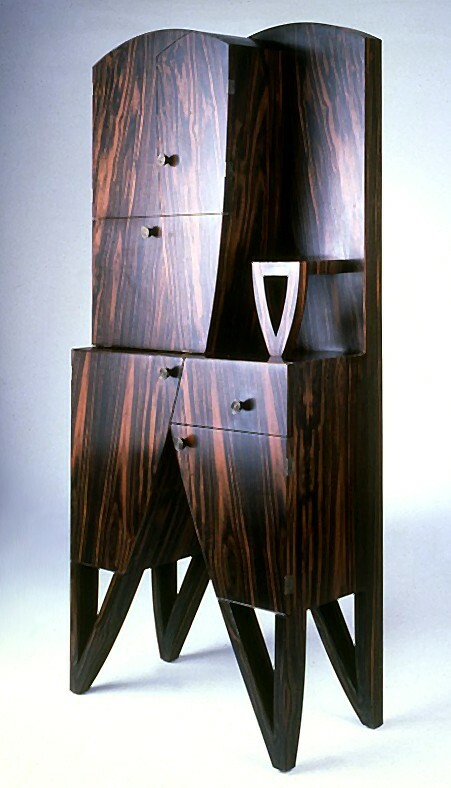 The finished cabinet, with its flat surfaces, its abstract, cubist forms and its asymmetry, is a departure for Schriber stylistically, but beautifully evokes what he says he was after, “an African vibe.” The unusual legs, reminiscent of African stools carved from solid logs, and the wonderfully rich and striated macassar ebony veneer combine to give the piece a powerful bearing at once formal and primitive. As usual in Schriber’s furniture, the function of the cabinet is deeply embedded in the design. The asymmetrical massing certainly relates to African objectsand to the cubism and other European art influenced by them-but it also creates a fitting niche for the sculpture. Although Schriber is comfortable designing formal pieces, he’s got a funkier side that comes just as naturally. In more casual pieces he often employs playfully exaggerated forms or makes unlikely pairings-aluminum sheet with shaped wood, industrial casters plated with silver, natural wood next to milk paint. He often paints such pieces, trading tactile appeal for a bright, vibrant informality. In his own house, which he built andfurnished, the milk-painted bar stools tucked under the kitchen island have a light, informal character nicely suited to eating at a counter. The clear-finished hand rests and foot rests put natural wood where you need it for touching and scuff resistance and also make a visual link to the pairing of wood and paint in the counter cabinets. Another lively essay in the use of paint is out on the wraparound porch, where Schriber has a series of chairs and settees. With their plank construction and flat, fanned backs they are instantly recognizable as cousins of the Adirondack chair. But the wedge-shaped backs, curved across the top, give them an unaccustomed buoyancy. Schriber heightened the graphic impact of the pieces by painting them in slightly electric greens, blues, and yellows. Schriber describes his approach to drawing as influenced by his brief, early architectural training. As he sketches in search of a design, he typically focuses on a single view, seeking one strong graphic image, in much the way an architect might begin by drawing the fa•ade of a building. Despite being the author of so many superb designs over the years, Schriber often feels at the drawing table like he is starting from scratch. Along the path that led Schriber into furnituremaking there were several lucky twists and unexpected awakenings at which he still expresses gratitude and surprise. He was born and raised in Dayton, Ohio, which he describes as having been, in those pre-rust-belt days, “a perfect place to grow up,” a vital, prosperous, integrated city with clean industry and fine old in-town neighborhoods. His father, the eldest of nine siblings, ran Schriber Sheet Metal, which was started by James’s grandfather. The company employed almost all of Schriber’s uncles, and it was a rite of passage for their sonsSchriber’s siblings and cousins-to work there in the summers. Schriber started earlier than most and enjoyed the work. By his own account, Schriber was “a completely unremarkable student,” and as the end of high school approached, he wasn’t sure whether he would apply to college or not. He had vague thoughts about becoming a teacher, but he also considered entering a sheetmetal apprenticeship program and working his way up at the family company. By chance, one of his two older brothers had a girlfriend from New York who took an interest in his decision and gave him the names of several colleges to visit in the East. In the fall of 1969, Schriber and his father drove out to see them. The first, Bard, was not a fit, but at the next, Goddard College, a small, progressive school on farmland in the middle of Vermont, Schriber immediately felt he’d found the place where he belonged. The magnet that pulled him there was a program in alternative architecture in which students learned by designing and making buildings. The program was led by Dave Sellers, a young, Yale-trained architect whom Schriber describes as “big, burly, red-haired, with large hands and a brilliant mind, a totally charismatic person.” Schriber enrolled. The members of the design group under Sellers were extremely driven and tight-knit, but there were myriad other groups just as passionate. In addition to the various academic groups, there was a group of glass blowers, a group of theater people—David Mamet and William H. Macy were there at the time—a group of writers, a group of potters, a group into radical politics whose teachers were said to be in the Weather Underground. Summing up the experience, Schriber says, “I was a Midwestern kid—to say it was eye—opening to me is a complete understatement. It absolutely changed my life. I had no idea this world existed.” It was by making a door, fittingly enough, that Schriber discovered a path from architecture into furnituremaking. With no formal background in building design, he had found it difficult to get his bearings on the large projects the design group tackled. On one building, he wound up offering to make the front door; although he was challenged by his lack of woodworking skills, he discovered a scale he could grasp. Goddard had little to offer in the way of instruction in woodworking, so Schriber spent the next year teaching himself, with help from a local furnituremaker, Randy Taplin. 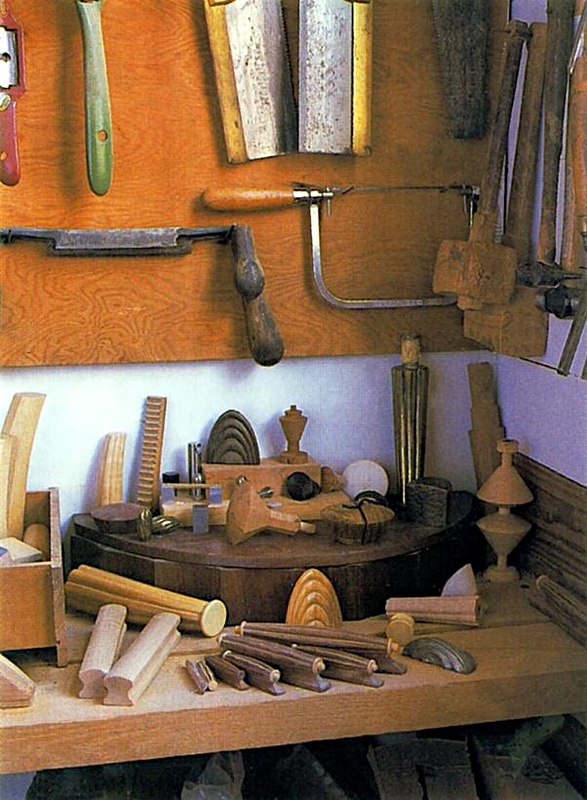 Schriber then took a year off to live locally and do woodworking independently. His next step, in 1974, was to find some training in his new craft. Dave Sellers suggested he look up Wendell Castle, in Rochester. Schriber hadn’t heard of Castle, but took the suggestion. Someone else told him about the woodworking program at Rochester Institute of Technology (RIT), and he decided to visit there on the same trip. Accustomed to the loose, wooly, and passionate environment of Goddard, Schriber found RIT, with its cold buildings, clean shops, and highly technical furniture, to be bloodless and buttoned up. “It looked like one big pocket protector to me, ” he recalls. When he met with Castle, he related his impressions of RIT, and Castle recommended he visit the Philadelphia College of Art (PCA, now known as University of the Arts), where his former student Dan Jackson headed the wood program. PCA and Dan Jackson were another revelation for Schriber. The shop seemed much more familiar-scruffy, with low ceilings, lots of dust, and funky pieces underway everywhere. And then Jackson came in. “My first thought was he looked just like Paul Butterfield. He was very taR and skinny, with greased back hair, and he’s wearing cowboy boots and pegged pants. His fingers were yellow from chainsmoking, and he was full of energy. I remember we laughed a lot during the interview. He was nothing like I expected a woodworker to be, but he was very appealing.” Schriber had found another mentor. Schriber had one year at PCA (which he describes as “terrific”) and then followed Jackson to Boston University the next year when he was recruited to teach with Jere Osgood at the Program in Artisanry (PIA). Boston University itself didn’t much appeal to Schriber, but PIA was another matter. The program was small, with just a dozen or so students in furniture and only four of them in the graduate-level Certificate of Mastery program that Schriber entered. As Schriber quickly discovered, the other students in the graduate level program were remarkably similar and compatibleall in their early 20s, hard-working, deeply committed to furniture and with tales to tell about the non-traditional routes they had taken to arrive there. And the teachers were outstanding-Jackson, Osgood, and the following year, Alphonse Mattia. 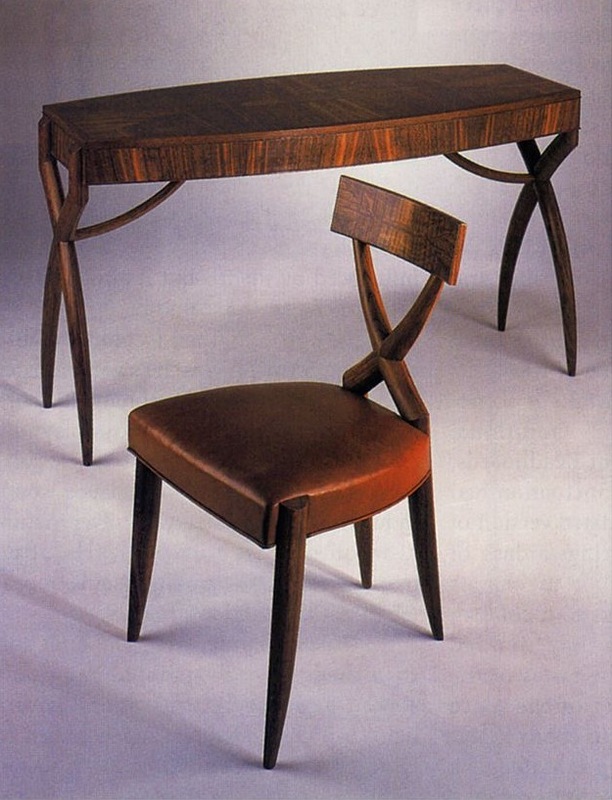 Remarkably, Schriber had landed in what he calls “another completely magical milieu.” The proof of that statement is evident in the lasting friendships and the equally lasting furniture the environment produced. 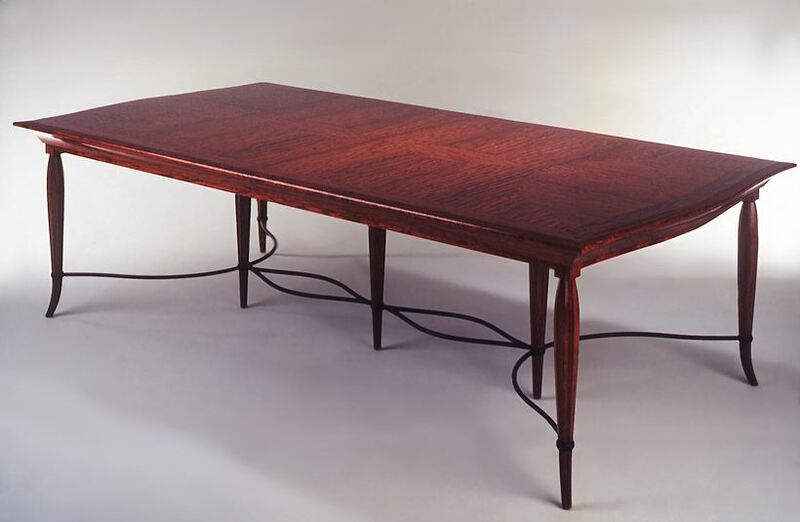 In its ten years at Boston University, PIA trained a stunningly talented group of furnituremakers-in addition to Schriber, there were his classmates Bruce Beeken, Tim Philbrick, and Rich Tannen, all still producing superb work two decades later. The stellar list of other alumni includes Michael Hurwitz, Tom Hucker, Wendy Maruyama, Garrett Hack, Tom Loeser, and Mitch Ryerson. When he was still in high school, Schriber had a girlfriend who was a painter, a gymnast and a dancer. “She was an artist,” he says now, “and I was not. And I didn’t know that there was a world in between that I could get to.” Listening to him describe his career and his work, I look up at the walls of his office, which are papered with hundreds of postcards, show announcements and clippings, depicting work by Schriber and his contemporaries. It is clear that he has found that world, and equally clear that he has helped to create it. Jonathan Binzen is a freelance writer and photographer. His book Arts and Crafts Furniture, co-authored with Kevin P. Rodel, was published in November 2003. ©2004 Ross Periodicals. Reprinted by permission. 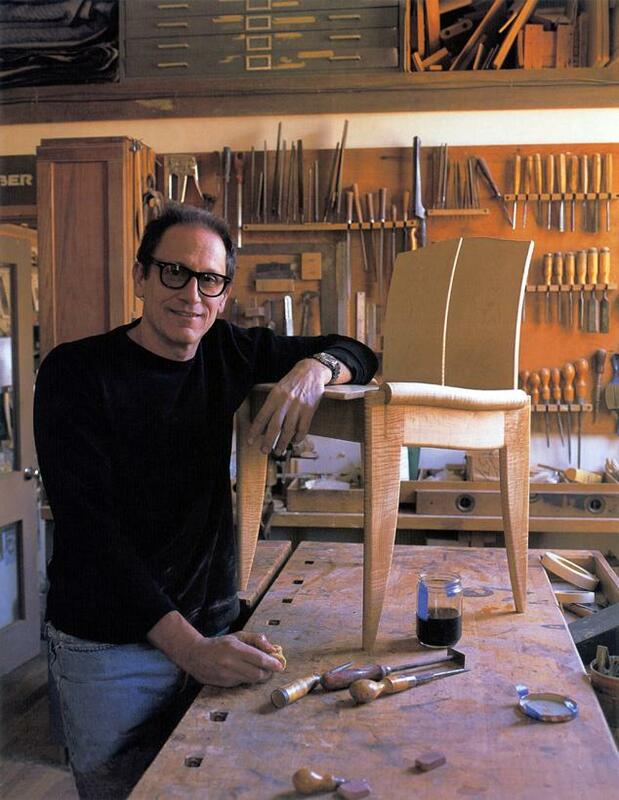 James Schriber in his Connecticut workshop with a just–completed side chair made of curly maple. Shop drawings on James Schriber’s drafting table. The sheet on top shows the drawing for the side chair shown to the right. In the kitchen of Schriber’s own house, milk-painted poplar bar stools with curly maple or pear. James Schriber has impressive dexterity as a designer. He’s as effective working with milk-painted plywood as with burnished hardwood. His range is evident in the various versions of these engaging little side tables. He spoke about the thought process behind the original design and the two later variations. “I made three generations of this table. To use automobile terminology, if the first one was the Impala, the second was the Belaire, and the third was the Biscayne. The first time I made a batch, they were out of solid wood. The second time, I mixed sheet aluminum with solid wood. And for the third series I used sheet aluminum and painted apple-plywood with the edges showing. “There is a fair amount of work in the wooden ones. Dove-tailing the little drawer and making the housed half-dovetail that joins the sides to the top, and hand-shaping the feet—it gets time consuming. So they wound up being pretty expensive for a little piece. “I thought they worked, and I made another batch, but I looked at them and realized that the box-like part could be made out of another material. The legs wanted to be wooden elements, I thought, and so did the drawer faces and the top, but the box could be anything. I had it bent up out of aluminum. That eliminated a lot of finish work and also greatly simplified the joinery. Instead of the housed half-dovetail, there’s simply a flange with screws through it up into the top. The aluminum shelf is attached with machine screws. And I had the drawer body bent up out of aluminum too, and put wooden fronts on either end. After making the second version, I thought, it doesn’t even need to be wood. It can be painted plywood and aluminum. So that’s what I did with the third generation. “They were aluminum with apple core plywood where the top and bottom are painted with milk paint and the plywood edge is visible. The legs are just sawed out of apple ply, and so are the top and the drawer fronts. So the amount of labor and the cost of matehals went down again. “I think it still works visually. It clearly looks like a production piece, but it still has that animated quality I liked in the first two versions. When you lose the solid wood you lose the tactile quality, but I think the distinct character of the design translates even though the materials have been reduced to their most basic. And it’s refreshing to build this kind of piece because the process doesn’t get so belabored.